Other companies charge large amounts of money for low quality gear. When it comes to providing for your family in times of disaster, you shouldn’t have to choose value over quality. We knew there was a better way. That is why we started Sustain Supply Co. Through rigorous testing, research, and then more testing, we have developed the highest quality & most comprehensive emergency kits available today. Period. Our strict “No Junk” policy ensures that if it can’t be relied on when you need it, then we want no part of it. Why buy gear you can’t rely on? At Sustain Supply Co., we believe our products will help you be ready for the unexpected. Through rigorous testing, research, and then more testing, we have developed the highest quality & most comprehensive emergency kits available today. Period. Our strict “No Junk” policy ensures that if it can’t be relied on when you need it, then we want no part of it. Why buy gear you can’t rely on? 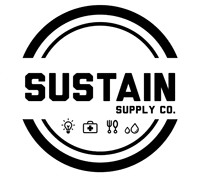 At Sustain Supply Co., we believe our products will help you be ready for the unexpected.